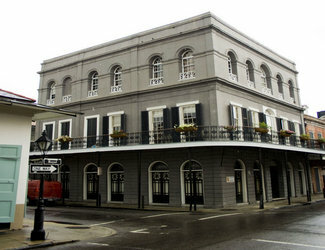 The LaLaurie House is considered to be one of the scariest real life haunted houses in all of New Orleans. It is considered to be one of the best known, but least loved haunted houses in the region. In the early part of the 1800s, there was quite a bit of death and destruction that occurred in this structure. The story that surrounds the LaLaurie House is not appropriate for those that have a fear of the dark, or are easily startled by creaking floorboards and the sound of whistling winds through cracked windows. Despite the fact that it has a history of one hundred fifty years, the story of this haunted house does not have a clear beginning or even a clear ending. However, it does have a story that it wants to convey to the living. Throughout this guide, you will learn many facts about this home – one of the most feared real life haunted houses in the United States. In the early part of 1832, a physician, Dr. Louis LaLaurie moved with his wife Delphine - by all accounts an incredibly attractive woman - into a new home in the French Quarter of New Orleans. They were well known for the social gatherings that they hosted and for the luxury and decadence of their lifestyle. Those who were so fortunate as to be invited to the home on Royal Street were amazed by the surroundings. The mansion was three stories tall and while the outside was plain and pristine, the inner portions of the home were lavish even by the standards of millionaires. Mahogany had been carved into the shape of flowers and human faces peeked from the woodwork also. The rooms glittered and glowed - lit by the candles that sat atop hundreds of fine crystal chandeliers. Guests who attended parties were served the most elegant of meals from the lavish fine china and were permitted to rest on the silks of the Orient. Their host was considered one of the most beautiful and elegant, as well as the most intelligent and well read women in the state. What was not seen beneath the fine boned beauty and the perfect manners was the cruel and calculating woman that Delphine LaLaurie actually was. Many suspected that she was not all that she seemed, but sadly, others know it as absolute fact. The doctor and his wife kept slaves. While there is no excuse for it by today's standards, it was the times in which they lived. Their slaves however were not the spoiled or loved slaves that some Creole families kept, not in the LaLaurie house. Their slaves were by all standards, petrified and violently abused. There were whispered rumors in the town of slaves that disappeared to never been seen again and one day Madame LaLaurie brought those rumors strikingly into the public eye. She was seen chasing a small girl, who, so petrified of the enraged woman behind her, climbed out onto a roof and jumped to her death. This day marked the time that the public started to talk more heavily about the LaLaurie House. The law of the day in New Orleans said that no one may cruelly mistreat their slaves. Upon investigation of the death of the little girl, the LaLaurie House slaves were found to be chained to the stove, to be whipped so badly that the authorities removed them from the house, but Madame was not about to be beaten that easily. She paid a family member to buy the slaves and to sell them back to her. Slowly, inexorably, the neighbors began to suspect things and one by one the people who had been their friends and enjoyed their company began to pretend an invitation had not arrived, to neglect to go and soon the entire family was no longer welcome in polite society of New Orleans... but the story does not end there. A raging fire broke out in the kitchen of the LaLaurie House not long afterward. Legends and tales say it was started by the cook, who, tired of being chained at her post, decided that death was preferable to life. The firefighters in the LaLaurie House - once they extinguished the blaze and moved about the house to discover if any other rooms were alight - found a secret that was horrible beyond all recognition and redemption. The investigators would forever live with the ominous secret that Mrs. LaLaurie had tried so diligently to cover up. They would be plagued by the visions of the scene that they stumbled upon in their daily thoughts, as well as the dreams that filled their minds while they slept. The secret would forever mark the period in which the LaLaurie House would be viewed as a home of evil rather than the home of Creole social elites. A secret room, locked in the attic was the scene of a horrific discovery. As the room was opened there were both male and female slaves, chained to walls, with sticks pushed down into their brains, women with their stomachs opened and their intestines being wrapped about their waist as a belt may be. One woman, according to the New Orleans Bee paper had her mouth filled with animal dung and then sewed shut. Some were dead or dying, others were alive despite amazing injuries such as arms removed. The firefighters fled in horror and despair and doctors were called into the scene to try to remedy those who had hands sewed to body parts. Some had even been shoved into cages too small and limbs broken to permit them to get in. The newspaper was awash with the story and the LaLaurie couple were no longer respected or even liked. A mob mentality prevailed and the hunt was on, but the doctor and his wife were never found. Is it any wonder that this home was considered one of the first real life haunted houses in Louisiana? The house was sold, and resold and sold again. It became a bar, a furniture store, a piano recital venue and even a restaurant. This real life haunted house became a luxury apartment and still no one would stay... haunted, they say, by the specters of a woman in old style dress bending over their baby, by a black man who chased them with whips and by screams of pain from all corners of the home. While the home was most beautiful it was not in a state of disrepair and was nearly impossible to find those who would live there more than two or three days. The stories were rampant about strange events taking place in the house. The LaLaurie House was abandoned for many years, but again, these days holds life. It was renovated and stands as a luxury apartment again... but the story doesn't quite end there. Just a few years back as the new home owners purchased the house and began to tear away at the floors for remodeling, the house gave up a few more ghastly secrets. Many different skeletons were found beneath those floor boards, and when the officials investigated the bodies they believed them to be more victims of Madame LaLaurie, hastily buried to get rid of them as rapidly as possible. They believe that it was the private gravesite of Madame LaLaurie. It was at this time that the LaLaurie house relinquished the remaining souls that were trapped in the home as victims in life and death. The stories of the LaLaurie house continue and it is said that even today, with all of the victims removed and properly buried, that a quiet night will bear witness to the fact that those who died so cruelly may not... even now... be completely at rest. What do you think? Today, the hauntings of this New Orleans home remains to be on top of the list designated at the world’s greatest unsolved mysteries.